Isn't this the famous line from the film Casablanca? Or that's what I've come to know. Because this line, though supposedly from that film, was never a part of its script. And was never uttered on screen. The actress Ingrid Bergman actually said something slightly different. 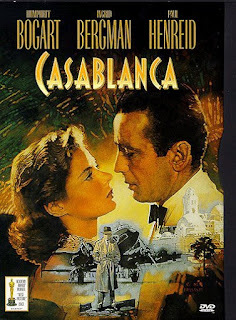 But Woody Allen later wrote and acted in a full-length movie-spoof on Casablanca, and even titled it, "Play it again, Sam"! Fully aware that it was a 'misquote'. I watched the original black-and-white movie classic five times. But until I read about this 'misquote', I could have sworn I heard her say - "Play it again, Sam." And, maybe, a thousand other viewers would have also sworn the same. But now, after I came across this startling piece of information, I quickly did some investigation into some 'famous misquotes'. And I was startled even more! "Elementary, My Dear Watson", is a misquote! Yes. You heard me right. It is not in any of those Sherlock Holmes' books! The creator of this famous fictional detective, Sir Arthur Conan Doyle had not, in any of his books, used that phrase. Even once! But how did this line become so famous? Well, such is the mystery of misquotation. It is said that the phrase "Elementary, My Dear Watson", first appeared in a film review in the New York Times, on October 19, 1929. And people have been using it ever since. Star Trek fans would say "Beam me up, Scotty" was a great line too. But that's another misquote. The closest that Captain Kirk, the head of Starship Enterprise ever came to it was an occasional, "Beam us up, Mr Scott". But, hang on. There are more historical misquotes. Did you know that Queen Marie Antoinette never said: "If they have no bread, let them eat cake!" And that Machiavelli never said: "The ends justify the means." Or that Murphy - of Murphy's law - never said: "If anything can go wrong, it will"? Even the quote attributed to Mark Twain, "The only two certainties in life are death and taxes," should actually be attributed to Benjamin Franklin who said it first. Misquotations and misattributions like these can be primarily ascribed to journalists and speakers who don't always get their facts right. When they should. Unlike in the olden days when word-of-mouth and passing-on-of-information-from-person-to-person was prevalent, today's journalists can actually verify things, more easily. I read an article recently, which opened with the words: The Bible says, "marriages are made in heaven......" But I found that nowhere - yes, nowhere - in the Bible are those words. And the author was definitely wrong! He could have simply verified with any of those online Bibles. But then, with the plethora of website content now available, one cannot simply believe everything in cyberspace. Misquoting - whether changing the lines, or attributing a line to a source not original- is never a good trait. And, when quoting famous people, films, or books, all writers and speakers must be conscientious and do double or triple checks. Because this attitude of arbitrary attribution should change. It's a change we need. Yes. "A change we need". But, please, let's not forget that it's a phrase popularised by a certain Mr Obama, who said it first!